We love a good peanut brittle. We know, we're a little biased. 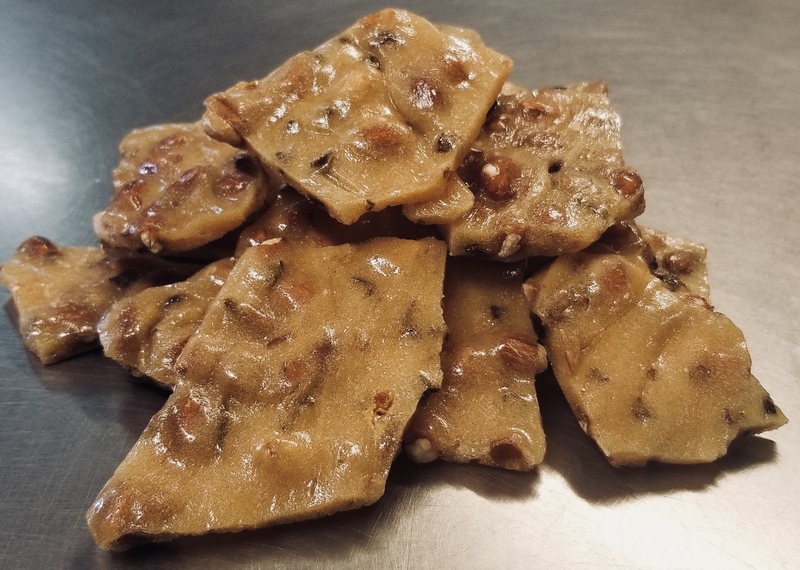 A classic Virginia peanut brittle recipe is the perfect complement to any holiday but we're spicing things up with a twist on this traditional family favorite. Add in a sprinkling of Jalapeño and bacon for a peanut brittle recipe that's sure to pack a flavorful punch. Your guests won't know what to do with themselves. Generously butter a 15x10-inch jelly roll pan. Set aside. In a skillet, melt 1 tablespoon of butter; add Jalapeños and cook over low heat until peppers are soft. In a heavy saucepan, bring the sugar, corn syrup, water and salt to a rolling boil. Add raw peanuts and chopped Jalapeño. Pro tip: for a salty crunch, add 6 pieces of cooked bacon (crumbled) when you add the Jalapeños and peanuts for a Jalapeño Bacon Peanut Brittle. Add 2 tablespoon butter then mix in baking soda. Whisk rapidly and pour onto buttered surface, spreading to ¼ inch thickness. When brittle has cooled, break it into pieces. Store in an airtight container. Makes approximately 2 pounds. From a simple mistake to a southern tradition to a trendy candy, peanut brittle is a holiday staple. Whether you're making grandma’s old-fashioned peanut brittle recipe or spicing it up with Jalapeños and bacon, always remember to love the land, respect your roots and give your best.